Tick Off! Tick aid Kit - Lyme Disease Coalition Inc.
As part of our "Target the ticks" prevention program we are offering FREE tick aide kits to help get you practicing prevention habits. These kits are available at all our events, with a chance to win in a FREE drawing. We encourage you to make your own kits with your favorite products and information. If you have a kit handy, in your car, at home, or in the office you will be prepared to remove and deal with it right then. Don't wait until you find a tick to learn how to help prevent Lyme and associated diseases. 1- A container to hold items needed - We use a pencil box or bag as most items will fit nicely and make it handy to have in your medicine chest or glove box. 2- Prevention tips - download or stop by one of our events to get brochures and other literature needed. *If you can't afford the items to supply a tick aid kit, please use the application to sign up for our assistance. *Also please consider signing up for a FREE tick drag to help with surveillance in our area. 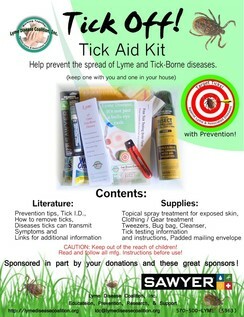 *Purchase your tick aid kit from us and help support our programs. *Support our Sponsors when purchasing products by clicking on their logo to shop online, or shopping at retail establishments. Sign up for a tick drag, or a FREE Tick Aid Kit! Click on the item you are interested in, and include you're email and name. We will contact you with information needed such as address for the tick drag, and/or qualifications for a FREE Tick Off tick aid kit. Thank you for participating!